Crowdfunding is becoming increasingly popular as a way people and charities can raise money, allowing people to give small amounts of money to contribute to a larger target. An innovative approach to Crowdfunding is “Soup”. Starting in Detroit in America there are now over 100 “Soups” in the UK and it has now launched in Maldon. Members of the local community are invited to attend an event, usually held in the evening, where they give a donation of a minimum of £5 for a bowl of homemade soup. During the event three local groups are invited to give short presentations on their activities in the community to pitch for a contribution from the donations at the door. Attendees can then vote and the groups walk away with the money in their pocket to spend on local causes. MaldonSOUP launched in November 2018 as part of our annual Winter Warmth campaign. The first event focused on projects that help people to stay warm over Winter. Presentations were heard by All Saints Primary School, Maldon Job Club and Essex Knitters and Stitchers. All Saints Primary won the vote on the night and received a contribution of £300 for their UP project. 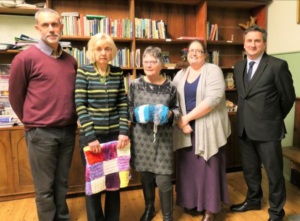 Maldon Job Club won £100 for local job seekers to have support over Christmas and the Essex Knitters and Stitchers received £100 for wool and other materials for a range of community projects.